C-reactive Protein (CRP) is a protein secreted by the liver in response to inflammation caused by injury, infection, or otherwise. The C-reactive protein (Qualitative) test detects the presence of C-reactive protein in the blood. CRP is a non-specific marker of inflammation and it can rise in any inflammatory condition. CRP Qualitative Test detects the presence of increased CRP in blood. C-reactive Protein or CRP is an acute phase reactant protein which is produced and secreted by the liver in response to any inflammation in the body, which may be caused by tissue injury, infection, or autoimmune diseases. CRP increases in patients of post surgery or patients suffering with trauma, heart attack, autoimmune diseases, bacterial infections, sepsis, cancer, etc. CRP levels are often increased before the onset of other symptoms of inflammation such as pain, fever, etc. CRP levels in blood fall as the inflammation subsides. Another version of the CRP test called CRP Quantitative Test measures the levels of CRP in blood and is prescribed more routinely. CRP test is performed to determine the presence of an inflammation or to monitor the treatment and progress of an inflammatory condition. It is a non-specific test. It can neither diagnose a condition by itself nor can it determine the location of a particular inflammation or disease. Other tests along with physical examination are performed to diagnose a particular condition and determine the location. CRP test can detect flare-ups in a chronic inflammatory condition, as well as is useful in monitoring the patient’s response to treatment. 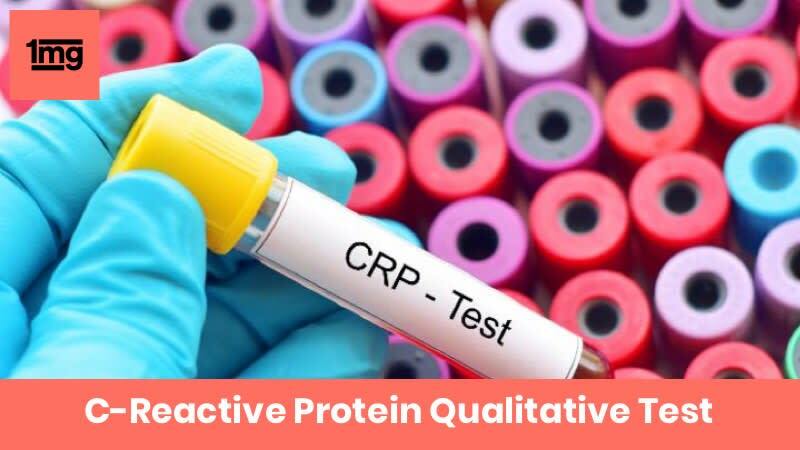 A variant of the CRP test is the High Sensitivity C-reactive Protein Test (hs-CRP) which is more sensitive as compared to standard CRP Test since it can detect even the lowest concentration of CRP levels in the blood. The hs-CRP Test is usually performed to determine the risk of development of cardiovascular diseases in otherwise healthy individuals. A positive test result means that the CRP levels in the blood are increased. Higher CRP levels indicate the presence of an inflammation which may be caused by an infection, trauma, autoimmune diseases, cancers, etc. The CRP Test can only detect the presence of an inflammatory condition. Other tests and physical examinations are performed to diagnose a particular condition. Q. What is the difference between CRP and highly sensitive CRP (hsCRP)? Both tests measure the same protein in the blood. The hsCRP is performed on healthy people to determine their risk for cardiovascular disease. Q. What factors can affect the CRP levels in blood? Blood CRP levels can be affected by: certain medications like birth control pills, Non-steroidal Anti-inflammatory Drugs (NSAIDs), obesity, Diabetes, smoking, heavy exercise and pregnancy. Q. Which are the diseases associated with high CRP levels? Conditions that are associated with high blood CRP levels include Osteomyelitis or bone infection, autoimmune arthritis (Rheumatoid), other autoimmune diseases like Lupus, connective tissue disease, etc., inflammatory bowel disease, tuberculosis, cancers like Lymphoma and infections (e.g. pneumonia). Q. What additional tests can be prescribed by your doctor in case the result of CRP Qualitative test is not normal? Additional tests that may be prescribed in case of abnormal CRP test result are: C-reactive protein (Quantitative) Test, Erythrocyte Sedimentation Rate (ESR) Test, Rheumatoid Factor (RF) Test, and Anti-cyclic Citrullinated Peptide Antibody (anti-CCP Antibody) Test.